This fish comes from the Amazon basin which reaches a length of 5 inches and a height of 8 inches. The distinctive shape of the body and fins adds variety to the community aquarium. Living Environment : The tank should be deep enough for the Angelfish to swim comfortably with its fins extended. All flake and freeze-dried foods are eaten by Angelfish, but live or frozen foods should also be offered. 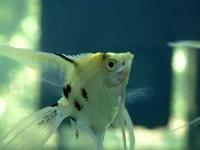 Angelfish will consume very small fish if given the opportunity. The Black Molly species is a hybrid, a cross between the Sailfin Molly and the Short-finned Molly. The Black Molly is all black in coloration with short fins. They may have patches of a slight gold or silver coloration when a juvenile, but will outgrow this with age. Living Environment : All flake and freeze-dried foods are accepted, but flake foods high in vegetable content are essential. The aquarium should be planted as densely as possible or have a thick algae mat. Mollies and other live-bearers enjoy occasional feedings of blanched zucchini.It does best when a teaspoon of salt is added for each gallon of water. The Black Neon Tetra boasts is one of aquaria's most beautiful, peaceful and unusual coloration. It grows to 1.5 inches. All tetras feel more secure and are more likely to swim in the open in well-planted tanks. Living Environment : The Black Neon Tetra will accept many small foods such as brine shrimp or daphnia, freeze-dried bloodworms and tubifex, micro pellet food, and a high quality flake food. It can be kept with lot of plants and other tetras in a darkish tank. The Black Phantom Tetra grows to 2 inches. It is a hardy species that does well in both small and large groups. Their flat oval body is silvery gray with a distinctive splash of black edged in white just behind the gills. The fins of the male are edged in black, while females are more brightly colored and have red fins. The males will sometimes visually threaten each other by facing off and spreading out their fins. Living Environment : All flake and freeze-dried foods are acceptable for the Black Phantom Tetra, but regular offerings of live brine shrimp should be included in its diet. Adult males are darker than females, and at breeding time their red coloration is greatly enhanced. Sometimes when males are kept together in a group, they will keep their breeding colors, perhaps as a form of competition. Living Environment : The Black Ruby Barb grows to two inches and needs plenty of room to swim. It also likes to have plants at the back and sides of the tank to take shelter in. The Black Ruby Barb does well on all flake and freeze-dried foods. The Bleeding Heart Tetra is a deep-bodied tetra that grows to 2 inches and must be kept in groups. They should be maintained only with other peaceful fish, including Angelfish. The Bleeding Heart Tetra's common name comes from the blood-red splotch on the fish's side just behind the gills.The males have an interesting dorsal fin; it's large and sharply swept back. These fish tend to be rather skittish, and you may see them swim frantically to and fro on occasion. Living Environment : They will thrive on flake and freeze-dried foods and an occasional feeding of live brine shrimp. The Bloodfin Tetra is an excellent community species that grows to approximately 2 inches in length. Like most tetras, they are most comfortable in a group of six or more. The female is the larger of the species. Although normally quite docile, they become rather active during courtship, sometimes even leaping out of the water. Living Environment : In the wild, Bloodfin Tetras normally feed on tiny invertebrates found in surface waters. They will eat all flake and freeze-dried foods. Over a dozen species of corydoras aeneus are usually available in stores, but the Bronze Catfish is an excellent representative of that whole group. This small fish, growing to a length of 2.5 inches, is peaceful and active both at night and during the day. It is very social, and at least two or three should be kept together. Living Environment : The Bronze Catfish eats all flake and freeze-dried foods and is particularly fond of live or frozen blackworms. Although it will consume any excess food in a tank, make sure this fish receives adequate amounts to eat.